Home Decor Wars (Part 1): How to Peacefully Decorate the Front Living Room Together (Hell if I Know!) | mrs. and the misc. As an example: This is one of the items he showed me last night that he wanted for our front living room … Seriously, are we decorating a log cabin in Montana? This will never, ever get into my house. How did this all start, well, I have my dear friends The Robertsons to thank. We recently visited their impeccably decorated Tulsa home, mouths agape at the cool ideas and great furniture pieces Mrs. Robertson, aka Jennifer, had assembled. The minute we got in the car to leave for Little Rock, my husband turned to me and said, “We need to decorate.” So, we went home, made a list for each room of the furniture items we want or need, and started prioritizing them. We’ll finish the master room with a new king mattress and bed frame (and new bedding, woot! ), reconfigure the media cabinet in the blue room (our main living room), and then, finally get to redecorate and buy furniture for the front living room. 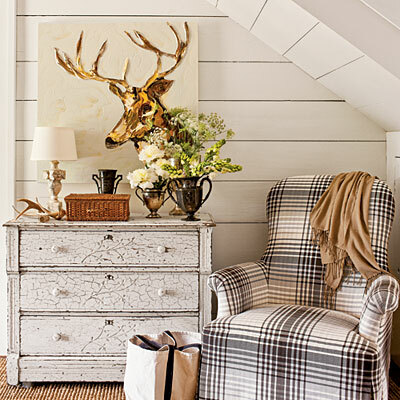 Notice the tasteful use of antlers … I think the deer painting and the antlers as a knick-knack are kind of nice with this rustic, homey vibe. 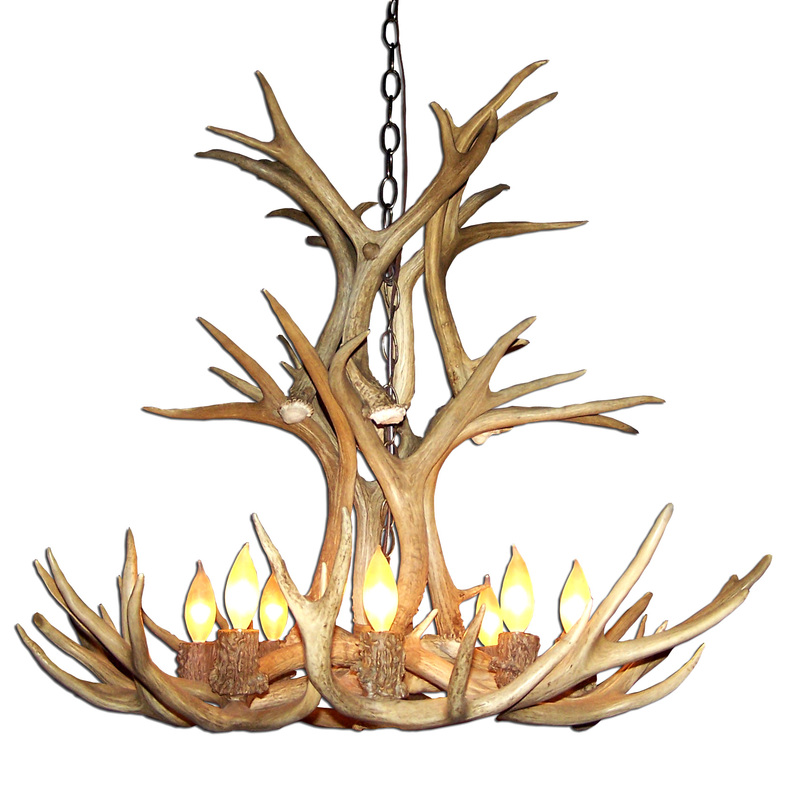 But an antler chandelier is never going to happen (unless we own a ski chalet in Jackson Hole, Wyoming one day). Honestly, while this looks a little old-fashioned, I absolutely love this room. It’s so warm and homey, but also feels kind of serious and formal. This is gorgeous. A little contemporary, but it really is nice. 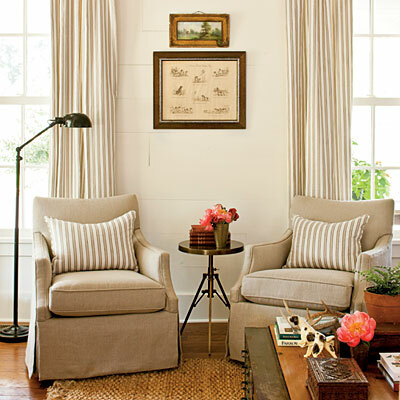 I like the mix of burlap looking fabric for the smaller chairs, along with different metals and woods. The little round end table is awesome, as is the large wooden coffee table with neat metal handles and such. I love this rustic wooden console table for behind the couch. And I love the rug…although it would be very uncomfortable to lay on. 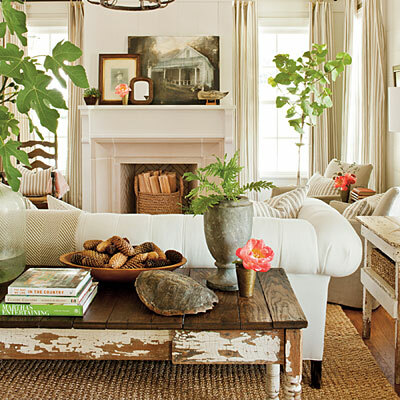 Love both of these rooms for their fabric choices and wooden and iron elements. We have this same type of room set up too: two built-ins on either side of our fireplace. 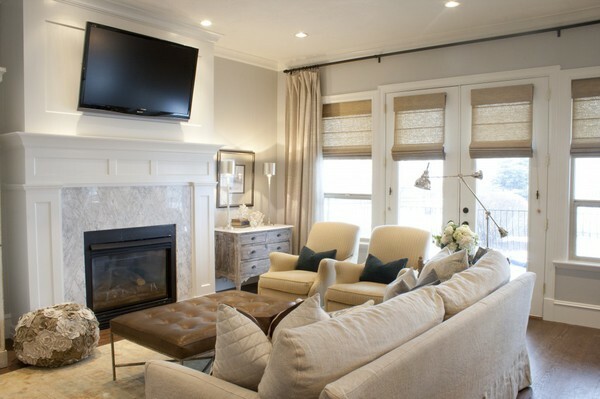 We want to hang a flat screen above the fireplace and set furniture around the room sort of like this. These have the rustic, warm and homey feel that we like, but the beams (above) are not possible in our front living room cause the ceiling isn’t high enough for that. 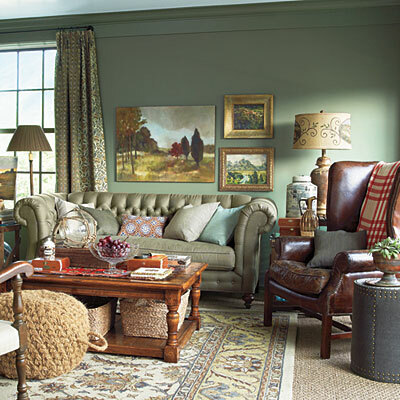 I love the colors and the coffee tables/ottomans and the round end tables. 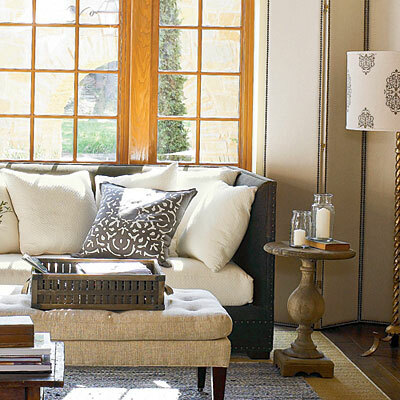 Love the iron chandelier, obsessed with the old wood coffee table and love the console table behind the couch with the round wood mirror. I’m trying to gather a ton of ideas onto my Pinterest page, so that I can show my husband and hope that he’s game for some of these ideas. If you know of other great blogs, Pinterest pages or websites with good ideas for rooms like these, please share them in the comment field below so I can take a look. I need all the help I can get. You decidedly put a new twist on a topic that’s been written about for years. Wonderful stuff, just great! I enjoy reading a post that will make people think, thanks and we want more! Added to FeedBurner too.